Pink is one of the most sought out color by women. 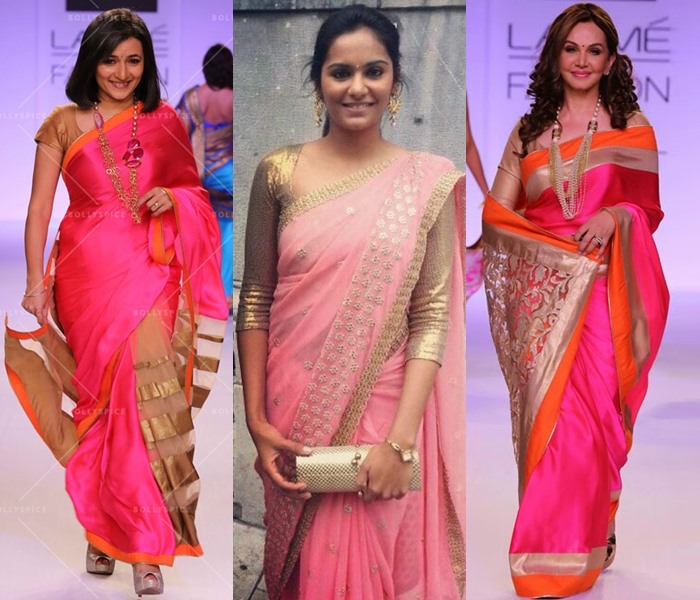 Women love pink sarees of all shades. 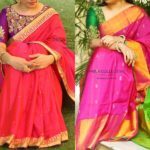 Every women wardrobe will have latest one of these sarees and it always pose a dilemma as to how to style this saree with proper blouse design. You don’t have to stick to the same matching blouse that comes along with the sarees. Let your creativity spin and try to shop below blouse designs for your pink sarees, and we are sure you can wear the same sarees multiple times without being at the risk of draping the same outfit again and again. Now without further delay, let’s move to the blouse designs that you can flaunt with pink sarees! Yes, you heard us right. Don’t wonder how black blouse will go well with pink sarees. These completely contrasting color go way beyond well. If possible, wear black blouses with floral prints or sheer net black blouses. These blouses blends with all shades of pink. Next to black, hues of blues can make a good match for pink sarees. If you wear designer pink sarees, pair it with velvet blouses. They make an extraordinary combination. 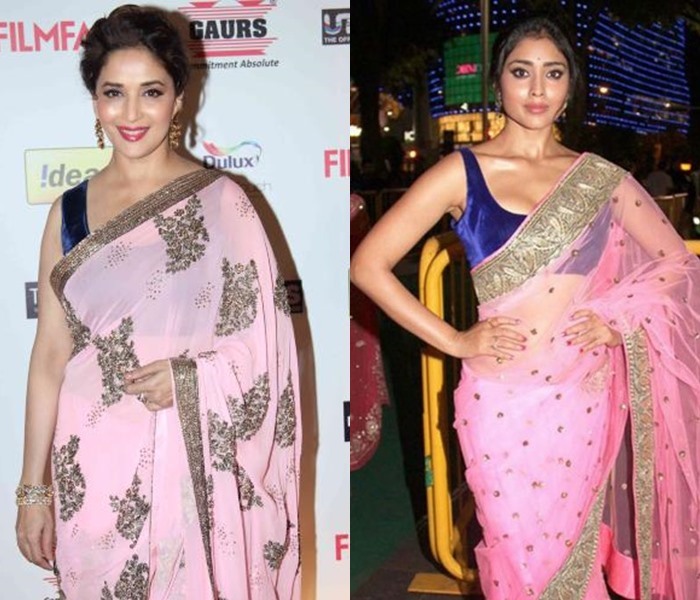 Light weight pink sarees can be safely worn with dark blue blouses. This might surprise many, but don’t raise your eyebrows please! 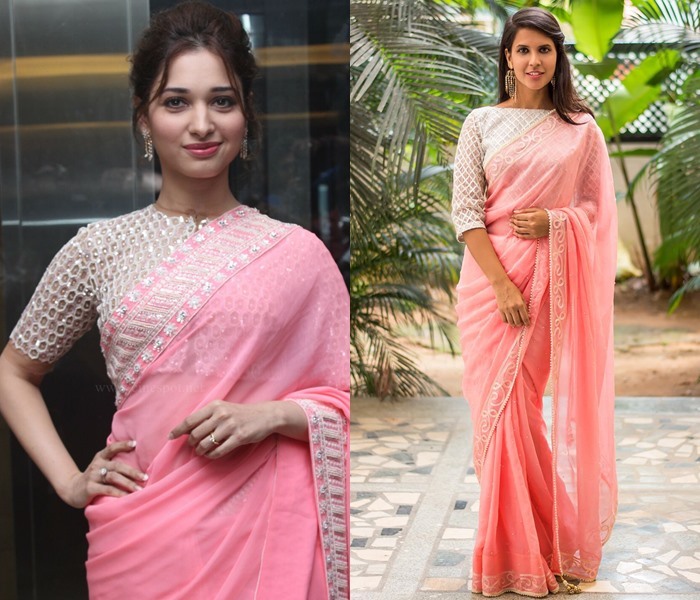 Pink sarees with white blouse might sound insane to hear, but when you actually wear them you will see the difference. Even the light pink sarees go well with white blouses. When you wear dark shades of pink, wear muted white blouses so they blend well! If you are wearing a designer pink saree or pink silk saree, then you can turn to golden shades of blouses blindly. This combination is best suited for weddings, parties and other festive occasions. If you want to add more richness, adorn your plain gold blouse with sequins or stone work. If you find golden shades won’t suit you, then try silver shades of blouses along with your pink sarees. These combo works well with party wear and designer pink sarees. These blouses suits well for teens or younger women who like to experiment with their sarees. Hope you have got ideas now to pair your pink sarees with proper blouse designs. 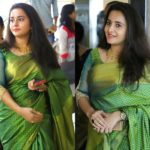 Make a statement with every saree you wear by exploring these ideas, and we are sure you will catch everyone’s attention in the crowd. Previous articleBored Of Churidhar Neck Designs? Check This Piping Works! Next articleOMG! The Most Gorgeous Lehenga Blouse Designs for Bridal Events!